Because I need a new challenge every month, I thought about an integration between OTRS and Alfresco to store documents, which are sent to customers via OTRS, also in Alfresco. I call this integration AlfrescoConnector. Because this integration will become very complex, I’ll split this how-to into several blog articles, which will be released regularly. In this article, I’ll show you how to create, delete sites and how to create, delete folders in Alfresco. To complete this how-to, you need at first a running OTRS and an Alfresco system. For some operations, you need special privileges in Alfresco (e.g. administrator privileges). 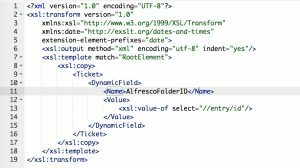 The REST/JSON API of Alfresco is activated by default. 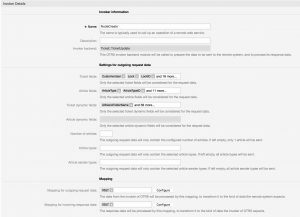 The AlfrescoConnector can be useful for companies who are sending documents to their customers via OTRS and have to upload them to Alfresco. 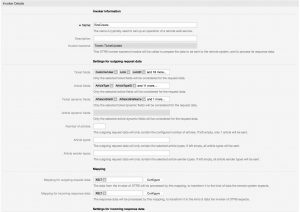 To improve this workflow and to prevent agents from manually uploading documents to Alfresco, you can use the connector of this article. 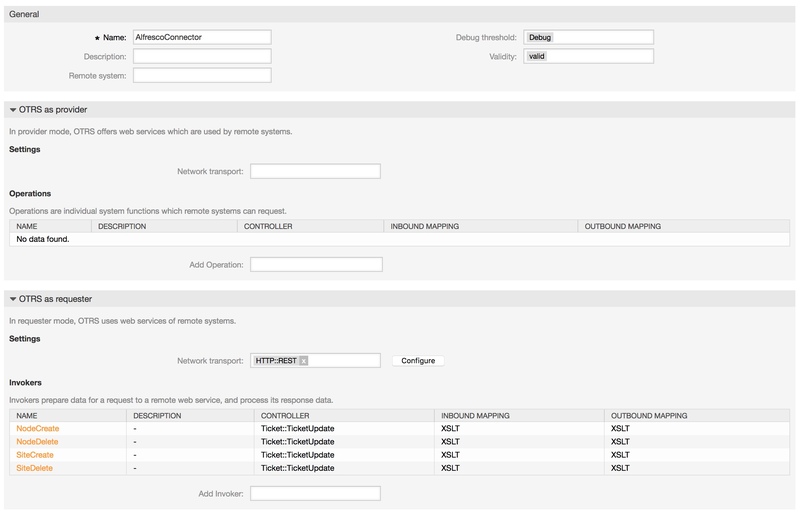 Now we can start with the configuration. The name of the new web service is “AlfrescoConnector”. Afterwards, you have to set up the needed invokers. Now you’re ready to start the configuration of the Invokers. 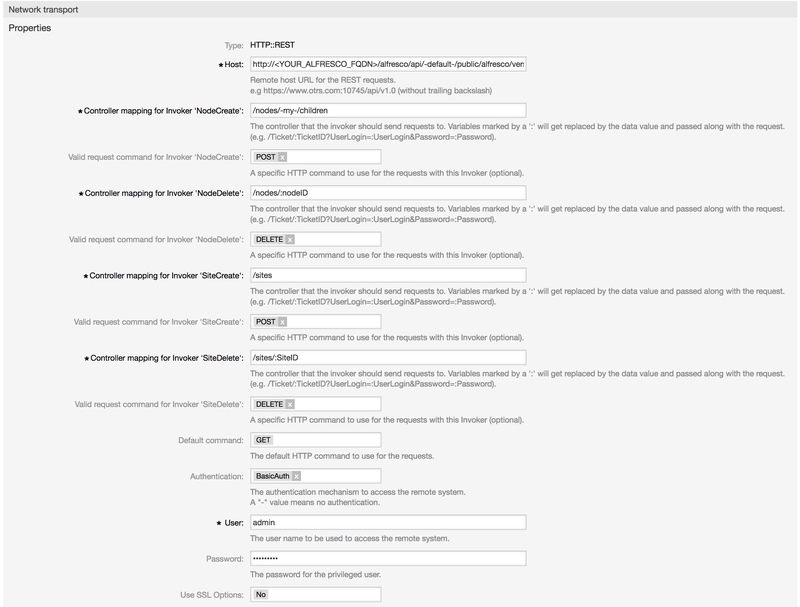 At first, we’ll create an Invoker for adding new sites to Alfresco. 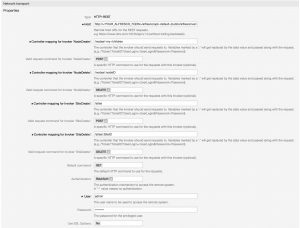 Set up an Invoker called “SiteCreate” and select all the needed data for your outgoing requests and use “XSLT” as mapping for your outgoing and incoming response data. 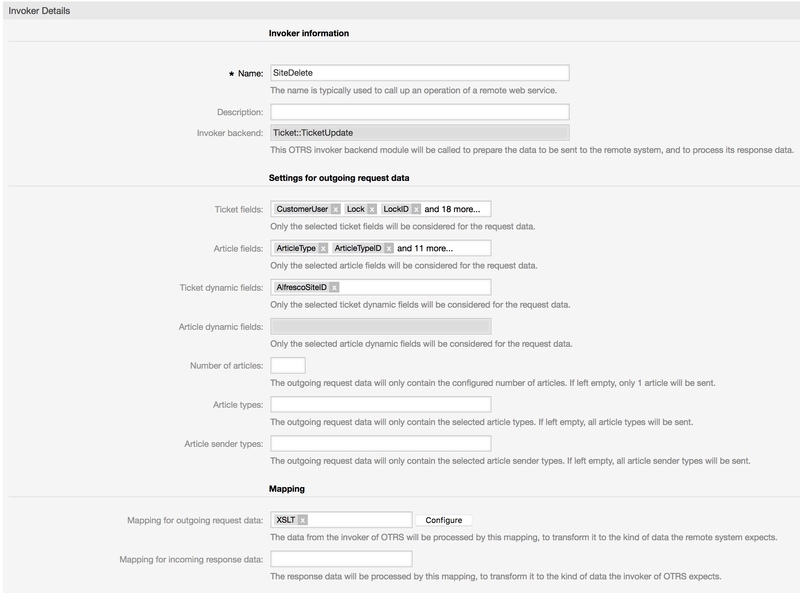 For the incoming response data, you have to select the dynamic field “SiteID”, which you created before. The next invoker is “SiteDelete”. 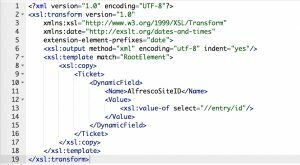 Select all the needed data for your outgoing requests (please don’t forget the dynamic field “AlfrescoSiteID” in the “Ticket dynamic fields” drop-down) and use “XSLT” as a mapping for your outgoing data. 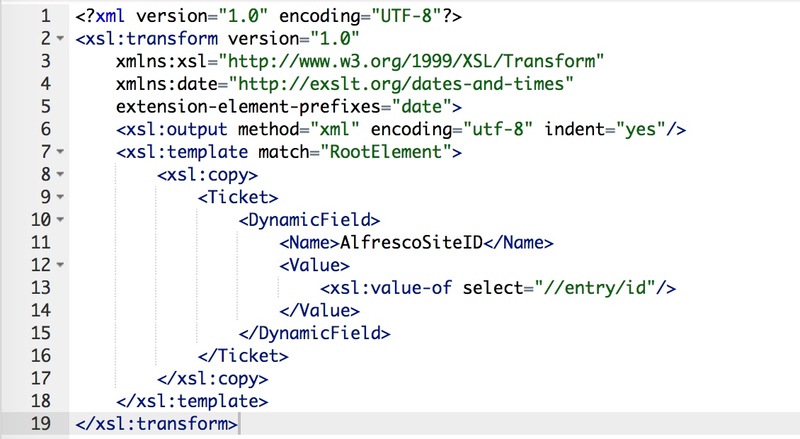 As outgoing XSLT-mapping, you can use my example. 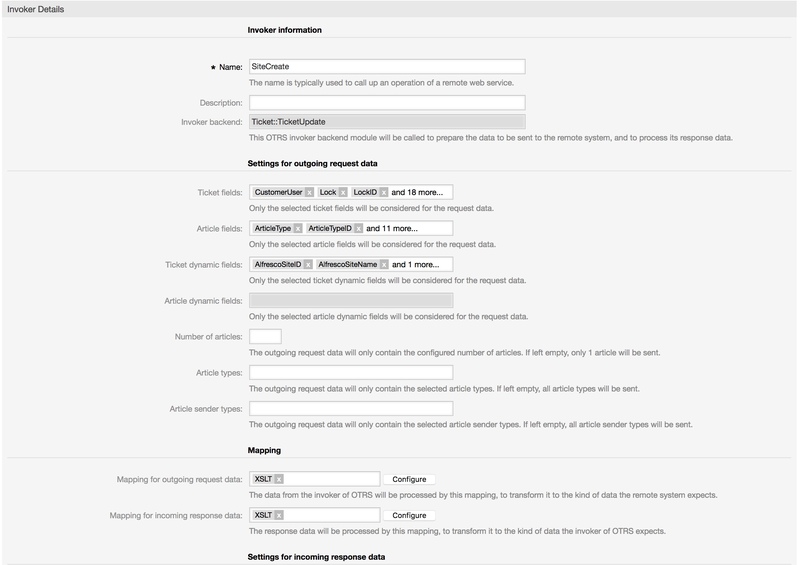 A mapping for the incoming response data is not necessary because Alfresco sends an empty response. The used “Event Trigger” is the last point for this Invoker. Just select one and you’re done with the second Invoker. In my example, I’m using a “TicketSubscribe” Event. The next Invoker is “NodeCreate”. 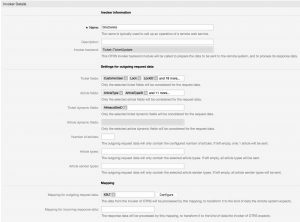 Select all the needed data for your outgoing requests and use “XSLT” as a mapping for your outgoing request and incoming response data. This mapping stores the NodeID in the dynamic field “AlfrescoFolderID”. The “Event trigger” is the last point. Select one and you’re done with the next Invoker. The next invoker is “NodeDelete”. 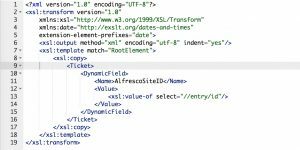 Select all the needed data for your outgoing requests (please don’t forget the dynamic field “AlfrescoFolderID” in the “Ticket dynamic fields” drop-down) and use “XSLT” as a mapping for your outgoing data. Because the answer is empty if it was successful, you don’t need a mapping for the incoming response data. The used “Event trigger” is the last point. Select a trigger of your choice and you’re done with the last Invoker of my tutorial. 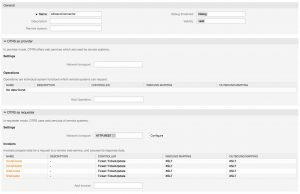 Please select “BasicAuth” for authentication and use a valid user. In the next blog article for the AlfrescoConnector, I’ll show you how to create files and additional users in Alfresco. You can also use other resources which are provided by the Alfresco API.